You can use your sewing machine to make a project for your sewing machine with the pattern for a Quilt Squares Sewing Machine Cover. The free quilt block pattern is easy to do in an evening, and you'll have a sturdy new way to keep dust and dirt off of your sewing machine. Whether it's for yourself or a fellow sewist, this creative way to use quilt squares will be one of the most useful projects you'll ever make. For more free quilt patterns, check out 25 Easy Quilt Patterns for Beginners + 7 New Quilt Patterns. Can this same pattern be used for a toaster cover? I can see it being done by making the cover to the measurements for the toaster. I think it can be used for many things also like a breadmaker a blender just by adding or taking away some quit pieces and cutting the desired size. Great idea too. you can hide the things that you do not like to see and enjoy some pretty fabrics aat the same time. Have you made one yet? I like this cheery sewing machine cover. Sewing together quilt squares is easy and quick. The instructions indicated 24 five inch squares were used to make the cover, a lining, and bias binding finish the inside and edges. Great scrappy fabric project. This would be a cute gift for any sewer as well. Too cute! 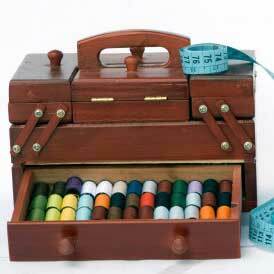 I should make my mom one of these for her sewing machine! I tried to print this pattern for a quilted sewing machine cover but it won't let me. Nice and basic cover.. I would add piping on all the seams, and a fabric handle of some type. Nice job!